I wanted to take a trip down memory lane and share some birthday memories with you all... My family and friends have always made it a point to go the extra-mile when it comes to birthdays! I can't complain... I love a good party!! I couldn't resist... gotta love this picture! I am guessing I was about 1 1/2! This was the year Hawk Nelson sang Happy Birthday to me :) Jonna and I celebrated our birthdays together at Club3Degrees. As you can see from the picture... 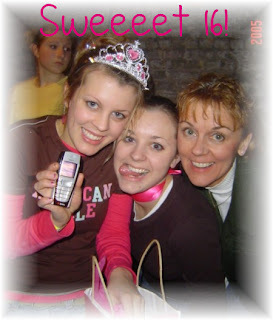 I got my FIRST, EVER cell phone. I thought I was a big deal!! Notice the pink ribbon around my sister's neck... yes, that was MY idea. Ha. Kelsey in blue, Kat in pink [no fair! ], Ria in purple... this was our combined 17th Birthday Parties. It was a blast! We had tons of our friends from high school attend - big dance party and lots of food. 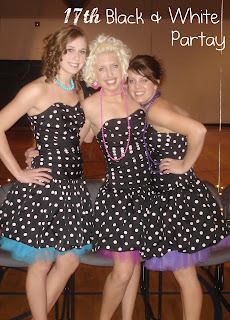 It was a black and white party, but because we were the birthday girls... of course we were able to wear color! My 18th birthday was SO fun! Josh and I had been dating for 3 months at this point in time. My family, friends & Joshua threw a surprise party for me at The Old Spaghetti Factory downtown, Minneapolis and to follow we went ice skating at The Depot [indoor rink]. It was sooooo much fun and one of the snowy-est days of the year. Yikes! 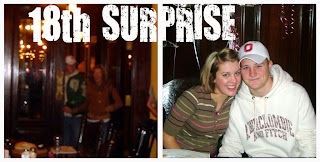 I only maybe, kind of knew about the surprise... but there were SO many people that I wouldn't have expected that came! The BEST year Yet! Josh proposed in December when I was 19. 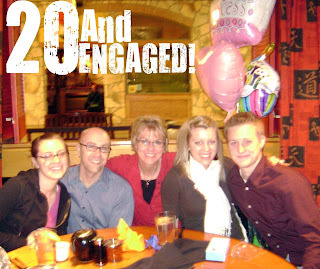 I was SO excited to be 20, because it was the year we were going to get married! I celebrated with my cute family at Big Bowl and had a wonderful time. It was VERY special. I also entered the... Twenties! What will my 21st year of life bring? I am excited for today... Josh has planned out the day and we both took off work! I will be sure to post lots of pictures from the activities and celebration. 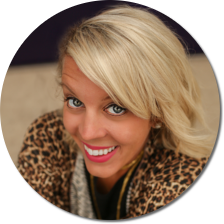 I am SUPER excited to have a "remix" of my 18th birthday and eat at The Old Spaghetti Factory and go Ice Skating with our families tonight at The Depot... That's all I know :) My hubby is in charge! I love that you have all these wonderful birthday memories may your 21st year be the best yet. 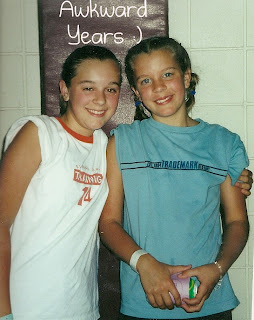 Oh this was so fun to read all your birthday memories :) love you ! Left a blog award for you on my blog. What a great post...may have to steal this idea for my 27th! Happy Happy Birthday, hope its a great one! Happy Birthday! Hope you have an amazing day!! Hope you have a very Happy Birthday with some more great memories for you. 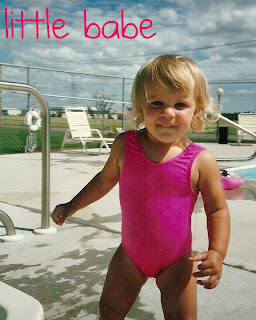 I love the picture of you and the pink swimsuit. how adorable!! Can't wait to see you tonight, loves ya!! Happy day!! So fun to look at all these old pictures! Happy birthday!! I hope you have a wonderful day. Happy birthday!! I got engaged in December when I was 19 too, then we got married the day after I turned 20... I spent my 21st birthday pregnant with twins(surprise!) =) You never know where God is gonna take you! What a great post! Hope you have a Blessed Evening! Yay, so fun!! :) My 21st birthday is in less than 2 months! Uh, and somehow I forgot to say HAPPY BIRTHDAY!! 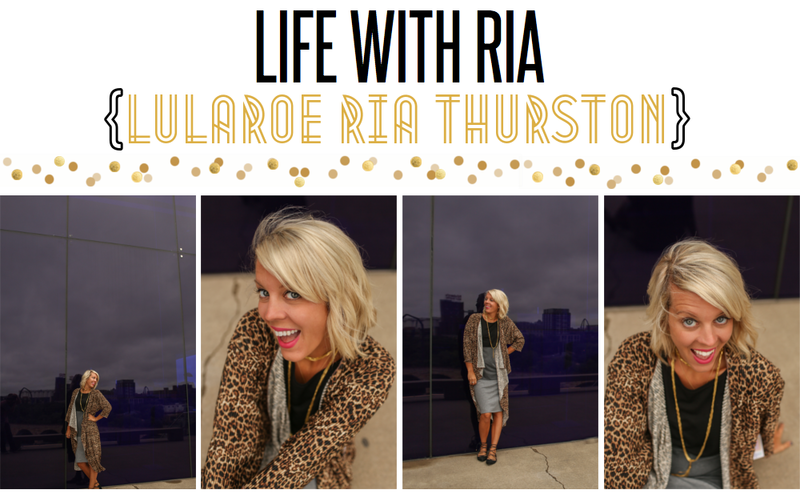 Ria... you still look Sweet 16! Ria, just to let you know.. I LOVE YOUR HAIR DARK!!! AKA 17TH BDAY!